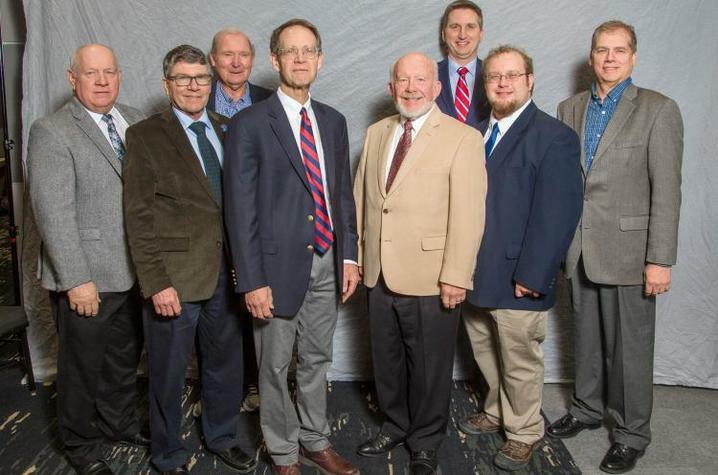 (Left to right) Warren Beeler, Robert Houtz, Lloyd Murdock, David Van Sanford, Rick Siemer, Chad Lee, Henry Siemer and Carl Schwinke. Photo by Matt Barton. LEXINGTON, Ky. (Jan. 25, 2019) — Siemer Milling Company is making a gift of $1 million to the University of Kentucky Grain and Forage Center of Excellence to support initiatives to improve grain quality and agronomic productivity of wheat in Kentucky and the region. Siemer Milling opened a flour mill in Western Kentucky 23 years ago to be closer to its largest customer and discovered that wheat growers in the region were among the most sophisticated in the business, said Rick Siemer, president. Siemer is a 136-year-old family and employee-owned company operating wheat flour mills in Teutopolis, Illinois; West Harrison, Indiana; and Hopkinsville, Kentucky. The grain milling operations purchase 25 million bushels of locally-grown wheat and produce 750,000 tons of processed wheat products annually, including flour, wheat bran and wheat germ. Facilities for the Grain and Forage Center are under construction at UK’s Research and Education Center in Princeton, Kentucky, as part of a renovation and expansion project. Among the improvements are updated and state-of-the-art meeting facilities, laboratories and offices, and a boost to the center’s high-speed internet capabilities to allow graduate students stationed at the center to remotely participate in classes in Lexington. These improvements are expected to be completed this summer and will enhance the college’s extension, research and teaching missions. More information about Siemer Milling Company can be found at www.siemermilling.com. More information about the UK Grain and Forage Center of Excellence can be found at https://gfce.ca.uky.edu.